Why do I have unexpected drafts appearing after posting content to Tribes? Using the Tailwind Extension to post content to Tribes? Here's why your drafts are still hanging around. Using Tailwind's Tribes feature is a great way to share original content you've created, while at the same time find like-minded content to help enrich your Pinterest feed and engage your followers. Pair the power of Tribes with the ease of our Browser Extension and you've got a superb setup for easily sharing content! However, you might have noticed that when you use the Browser Extension to publish content to your Tribes, you're often left with drafts that seem to want to hang around when you didn't ask them to. After this draft is made, you have the option to schedule Pins from the Extension and the Pins will move from "Drafts" to "Scheduled Pins." But if you don't actually schedule the Pins, they will stay put in your drafts - such as in the case of sharing content with your Tribes. 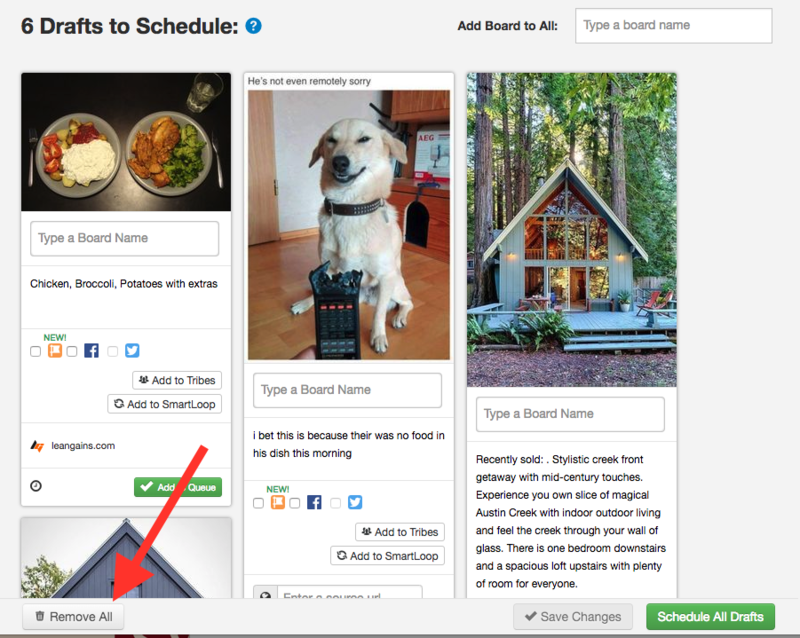 When you're sharing content to your Tribes directly from the Extension, you may not realize that a draft is being made, more than likely because you're publishing the content to your Tribes by selecting the Add To Tribes button rather than actually scheduling the content to post later. Had an "A-ha!" moment yet? If you think that the unexpected drafts you're seeing might be from this type of Extension use, there are a couple ways that you can remedy these drafts from lingering about. 1. 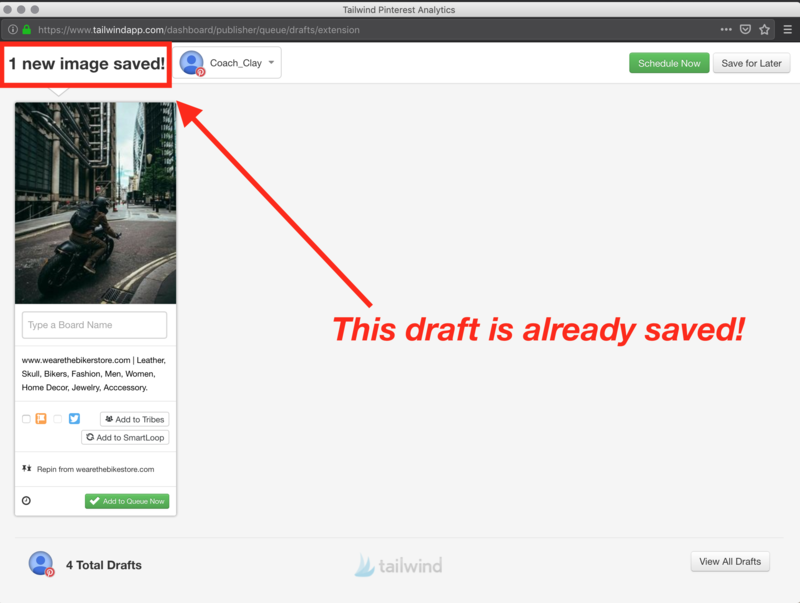 Go to the Drafts area of your Publisher within the Tailwind Dashboard and manually delete each draft after you've added it to your Tribes feed. Simply hover over the draft that you'd like to delete, click the Trash Can Icon, then hit Confirm. 2. You can immediately delete the draft inside the Extension using the Trash Can Icon as seen in this quick tutorial video. 3. There's also the option to get rid of all your drafts at once using the Remove All button at the very bottom of your drafts page! If you're hopping around from site-to-site, or pin-to-pin, pushing quite a bit of content to your Tribes, using the Remove All feature will save you some time at the end of your browsing session by allowing you to click once and do away with all your residing drafts. The combination of Tribes and our Extension is a powerful pair indeed, but if you're looking for less clutter, don't forget to go in and sweep those Drafts every now and then!